This all-state thing just seems to come easily for 5-star girl’s basketball recruit 5-foot-10 Jordyn Oliver of Prosper. 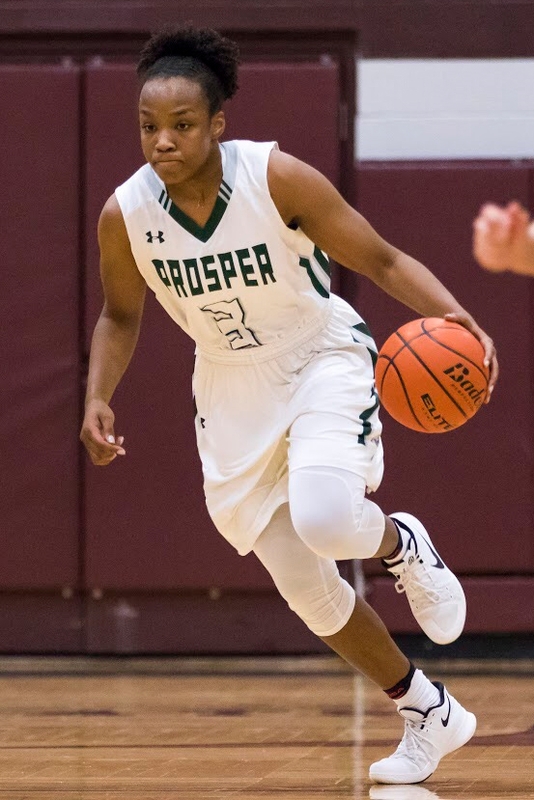 A First-Team Texas Association of Basketball Coaches selection from 2016 to 2018, she aims for a fourth spot on the coaches’ dream team in 2018-19 and a possible first-ever state championship for Prosper, which opened when the town incorporated in 1914 with just over 500 residents. And for the rapidly-growing North Dallas suburb with five state championships from Class A (baseball in 1984) to 5A (volleyball in 2017), that goal and a standout senior season for the student-athlete pledged to Baylor for the 2019-20 season is a distinct reality. Oliver and her teammates under head coach Trey Rachal have set the 5A crown as a team goal after the Lady Eagles fell to Frisco Lone Star 46-42 in the regional finals last February, and if Oliver plays up to her All-State potential again, the 2018-19 squad has a fighting chance. The much-honored member of USA Basketball’s Under-16 national squad in summer 2017 comes by that ability naturally. Her solid guard play allowed the USA squad to capture the gold medal in the FIBA Americas Championship played in Argentina. She is the kid sister of the family to older brothers Brennen Bryson-Adams (27), Marcus Oliver (25), and Dwayne Oliver II (23), and the daughter of U.S. Navy veteran Dwayne Oliver and wife, Carmell. Keeping up with those three other siblings and trying to emulate them in several sports possibly helped make Jordyn the national-class athlete she is today. Her father, whose father (Jordyn’s grandfather) Billy R. Bryson, served in both the U.S. Army and U.S. Navy, and mother were great encouragements when Jordyn started bouncing a mini-basketball around when she was just three years old and living in the Fremont-San Francisco, Calif., area. And her uncle is none other than former Major League Baseball performer LaTroy Hawkins, who was in the big leagues for 21 years and pitched for 12 teams. Another cousin, Jared Cunningham, starred in basketball at Oregon State University and for the Dallas Mavericks as a rookie in the NBA while continuing his pro career overseas during the 2017-18 season. When her father was transferred to the North Texas area a few years later, she quickly adopted the historic culture of girls’ basketball in the Lone Star State while playing on select teams and traipsing throughout the Southwest for tournaments and showcases with the Nike ProSkills EYPL elite crew. The multi-time all-state and all-region standout came to play and star early for the Lady Eagles beginning with her freshman season in 2015-16. She hit the court running in November and ended the 30-6 campaign for the Lady Eagles with 36 starts, 18.5 points per game, 7.1 rebounds per game, 4.1 assists per game, 3.1 steals per game, and three blocked shots each contest while using her 5-foot-10 frame to perfection. She also led Texas Class 5A with 544 points during the regular season. A year later, Oliver earned District Player of the Year laurels to compliment the statewide honors while starting all 35 games for the Lady Eagles, scoring 15 points, grabbing seven rebounds, averaging four assists, 2.5 steals and one blocked shot per game for a youthful squad. The team again made it three rounds into the state playoffs before falling to Frisco Liberty 49-46 in the regionals. As a junior, she topped the 31-4 Lady Eagles, who finished 14-0 in district play for the first time in school history, with 20.2 points and 8.4 rebounds per game while shooting a career-high 53.7 percent along with four assists per contest. That gave the Lady Eagles a combined record of 86-20 for a .811 winning percentage and 7-3 record in postseason play since 2016. 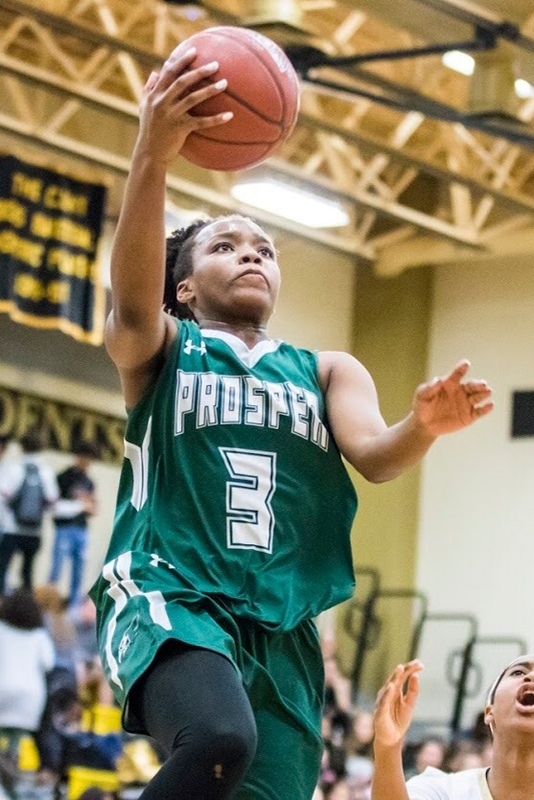 So, besides the state championship hill to climb, what could be in store for the “Prosper-ous” starlet in 2018-19? “I know I’m where I should be, that I’m good enough to be where I am, but it’s still crazy to me where I’m at today,” Oliver said in a recent interview with ESPN.com. Her thoughts also bring up the idea so often referred to in athletics as “playing within your own skin” and show the determination she has to keep Prosper on the regional and national radar in 2018-19. Something tells even the most casual observer that Jordyn Oliver and the Lady Eagles just might take that next step and a March 2019 trek to San Antonio to compete for the cherished UIL trophy.